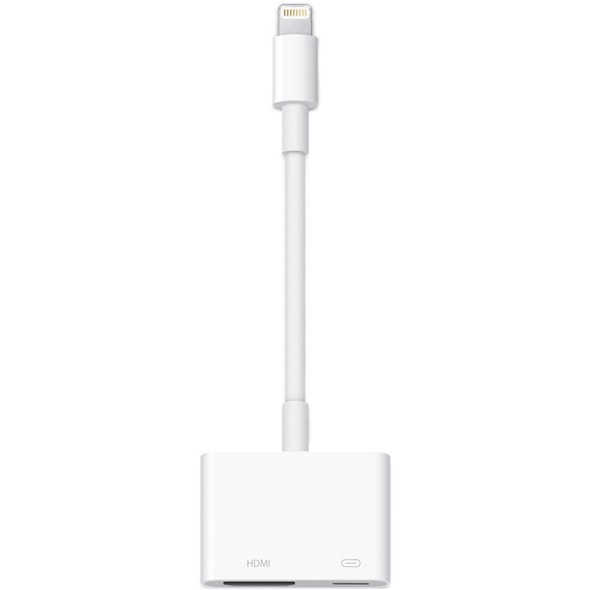 Apple has a habit for going against the grain when creating some of its adapters and peripherals, and on closer inspection, that’s perhaps never more apparent than in the Lightning to Digital AV adapter. You wouldn’t expect a great deal when stripping it down, but as Panic (of Coda and Transmit fame) dug up, there’s actually a fully-fledged computer, complete with an ARM chip and 256MB of RAM inside. The Lightning Digital AV cable’s main purpose is to allow recent iOS devices such as the iPad mini, iPad (4th-gen), iPhone 5 and iPod touch 5th-gen (basically any device with a Lightning dock connector), to output to HDTV through HDMI. 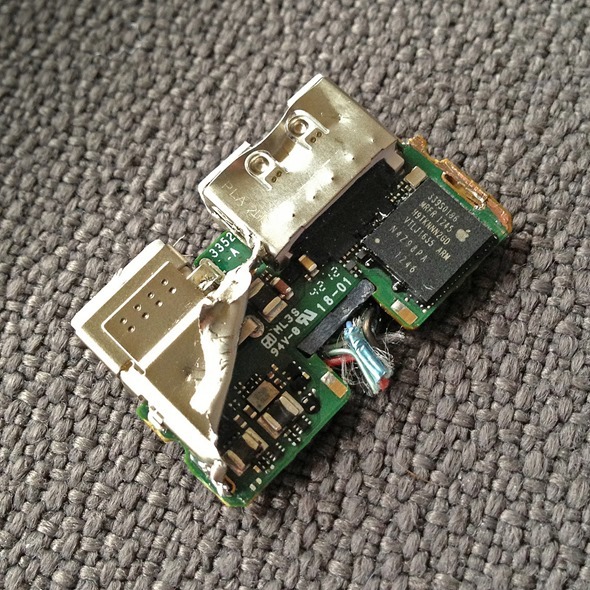 Having disassembled the adapter, Panic discovered that concealed under the hood reside several components you perhaps would not expect from such an innocuous bit of kit. The most exciting discoveries are, undoubtedly, the ARM chip and 256MB of RAM, and we wouldn’t be fulfilling our duties as techies if we didn’t at least attempt to investigate further. One of the obvious questions would be, what OS does it boot? @jmreid on Twitter (no relation) seems to think the adapter copies over a “mini iOS” from the connected device which boots intermittently, and although there’s no real way of proving whether this is indeed the case, it would go a long way to explaining why video out seems to take quite a while to proceed. As became apparent in the ongoing speculation of the Lightning dock connector before its eventual unveiling alongside the iPhone 5, the small number of pins within Apple’s proprietary cable was a stumbling block for a raw HDMI period, which will have prompted Apple’s design team to come up with something a little different. Panic alludes to the fact that the Lightning port is incapable of outputting raw HDMI as the rationale behind the complicated interior setup, which instead, uses a microcosmic AirPlay-like infrastructure which, if not obviously, has a detrimental effect on video quality. 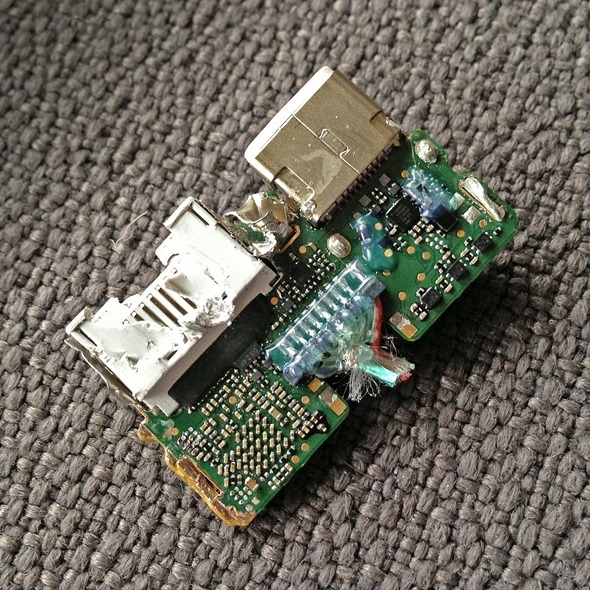 Seeing as it’s now the weekend, I anticipate many of you modders out there will be scanning forums looking for ways to push the boundaries of the adapter, and seeing as it contains hardware similar to that which graced early generations of the iPhone – why not?